Since Mr Zzyzx encourages us to post doodles, here is one of my favorites. The beauty of doodles is that they are not drawn with the idea that anyone else will see them, so they have an unexpected freshness that even surprises the artist. Such is the case here. This particular doodle was first drawn with a ball point pen, so all of the sketch lines show through the watercolor. Turning it into a watercolor illustration was an afterthought. 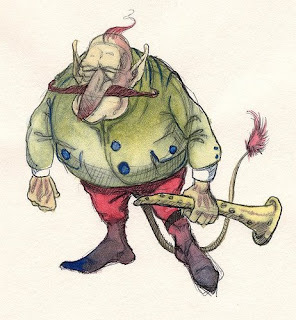 In the early-mid eighties when I drew the Elf, I had purchased my first set of Dr Martin's concentrated watercolors and looked for every opportunity to use them and found existing sketches to paint for practice. One convenient aspect of painting over ball point sketches is that ball point ink is greasy and repels water making it possible to see the lines through the paint. Of course, that is also the problem with using ball point: nothing is hidden. Painting with watercolor over pencil covers the lines better but the graphite softens the color of the watercolors because the graphite is somewhat soluble. That too can have positive effects depending on whether the composition favors a milder or bolder result. In my experience, the ball point does not interact with the watercolor and so maintains the intensity of the color. These amazing little fountain pens are one notch above a disposable pen and are refillable. 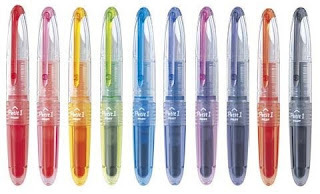 They come with a small capsule containing three cartridges of ink that match the color of the pen. You can buy the pens in groups or individually. Individually, they cost about four dollars each with $1.25 in shipping from Japan on Ebay. As the name indicates, these are very short pens measuring 4 1/16" inches (10.3mm) with the cap on and 5 inches with the cap posted. The girth is a comfortable 9/16 inches (1.4mm). The size and shape of these pens and the fact that they post to a normal length make them ideal pens to throw in your pocket or knapsack while you are out of the house/office. You don't have to worry about scratching them or losing them as you do with other fountain pens. This is really nice for the summer, when you don't have a breast pocket to safely store a better pen. The irony is that the Pilot Petites write so amazingly well, that you are inclined to use them even at your desk where the more expensive pens are looking down disapprovingly. In fact, these four dollar fountain pens write much better than a couple of $100 pens that I have.